The excursion begins by picking you up from the designated locations (which are available on the site). After a two-hour ride along the north coast, we turn towards south into the heart of Crete. At 10:00 we have an one hour coffee break at Agia Sophia Cave. We are excected to reach Elafonisi at 12:15 where we will stay until 15:45. Visitors will have 3 hours time to swim in the crystal clear waters and enjoy the beautiful sandy beach and its surrounding nature. At 16:30 on our way back to Rethymnon we will make a last short stop in Elos village. You are expected to return at your hotel at around 18:30 although time of arrival varies depending on your destination. 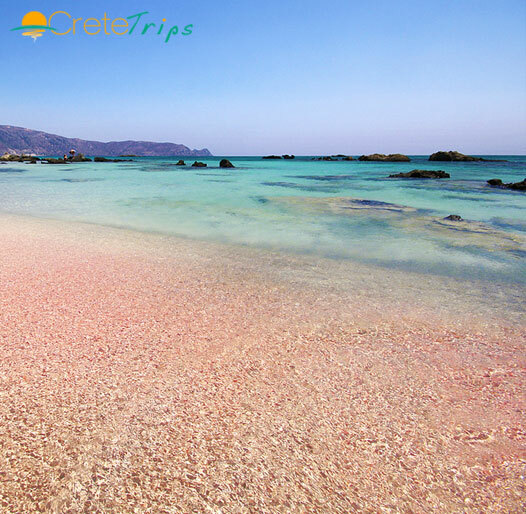 This is a direct tour to Elafonissi for people who want to visit this beautiful beach. The excursion is concentrated on Elafonissi, so we don’t make other stops to give as much time on the beach as visitors need. It is a long distance trip so we make short stops for coffee and toilet on our way to Elafonissi and backwards. Experienced English-German-French speaking guide on Tuesday, English-German-Russian on Thursday, English-German on Sunday available throughout the trip.